At Burns Estate Liquidators, our practice helps preserve history, recycle and reclaim wanted & unwanted items. We have experience with, but not limited to: art, firearms, furnishings and jewelry. We are vetted with the Department of Justice and work with a 1 billion dollar bullion company out of Dallas Texas for your precious metals. We are continuously expanding our knowledge as we grow our business. We will use all of our resources to ascertain the value for your possessions. It is not uncommon for us to seek a wider audience for your goods using: Sotheby's Christies Bonhams Live Auctioneers and eBay. With each new client, we execute a standard agreement that outlines the scope of our work. Of course, each estate is different, so each agreement will be customized to fit your needs. We have assisted many families through the estate sale process and we are proud to say they are all willing to give testimonials. In this business that speaks volumes. We work with Estate Heirs, Realtors and Trustees. We would consider it a privilege to work with you. Find our full testimonials on AngiesList.com we have earned The Super Service Award. This is a buyout shop for folks who cannot have an estate sale. New arrivals! Home owner has two homes on the same street! Just picked up the keys, save the date. Another load of merchandise in the shop! Shop Thursday 10-4; pop up shop New buyout coming next week~ I need to make room! Sweet Spot Cleanout- making room for incoming! Prominent Antique Dealer retires and leaves everything for an estate sale! All the usual household items and a huge number of specialty items! Take a peek at the photos and come see us! Charming Carmichael Estate with Amazing Shadow Boxes!!!!! Landpark at it's Finest! 50% OFF EVERYTHING!!!!!!!!!!! Arden Oaks Amazement 50% off most items! Call for gate code Susanne 916-826-4004I have update all photos. Everything you see is available as of Saturday night! American River Drive at it's Finest! This company has posted a total of 92 estate sales. Only the most recent 50 sales are shown. Excellent service from Susanne Burns. She went above and beyond to make sure I understood the process of liquidation, all of my options, and how the accounting process worked.... and that was before we even met in person! Susanne is very well-organized and a true professional at what she does. She truly cares about her clients and the emotional process of downsizing. She worked tirelessly to sell my items, and to sell them at a good price. She's completely trustworthy, very knowledgeable of a wide variety of items, plus has an amazing list of contacts for items that are outside of her expertise. She also has an extensive contact list of buyers, and presents items in the best possible way to maximize sales. I wholeheartedly recommend Burns Estate Liquidators. She did an excellent job for me. I would give her ten stars, if it were possible. Burns Estate Liquidators was recommended to us by our trusted realtor, who specializes in the luxury housing market in Sacramento. Our house sale was moving speedily towards a very rapid close date. Relocating from a large home packed with furniture, art, furnishings and collectibles to one having a much smaller footprint with no lead time to plan or execute an estate sale presented significant challenges and stresses for us. Susanne Burns saved the day by liquidating our home without an estate sale event, purchasing all of the items at fair price that we didn't want to travel. We wholeheartedly endorse Burns Estate Liquidators. Susanne Burns is a consummate professional who is also a joy to work with. We recognized and valued her expertise in appraisals, patience, fairness, advisement and transparency throughout the transaction. She packed up all of the outgoing items with extreme care and efficiency and even hauled numerous charity items to a local charity for us, returning to us a donation receipt. Highly responsive to the urgency of our situation, Susanne liquidated our home immediately after we'd spoken. She was "on the job" the very next day! At the end of a long and exhausting day of packing, Susanne patiently appraised my jewelry and paid fairly for that too. We could not imagine better service than that which we experienced with Burns Estate Liquidators. Erica and Susanna are true pros! Quality merchandise at fair prices. Always professional! Highly professional, accountable and efficient. Worked seamlessly liquidating an entire house exactly as planned while I was located in and communicating from another city. Takes care of every single detail from A to Z. This company sets the bar high and delivers! Went to my very first estate sale today! Susanne made it a joy. Lots of great items and all priced very fairly. I loved that everything was neatly organized. I found a great gift for a co-worker and soooo glad I checked it out. I think I may become an estate sale junkie! Excellent from start to finish. I loved the detail that Susanne and her mother brought to the table. I have worked with other estate liquidators before and I have NEVER experienced this kind of professional and dedicated service before. My mother in law had passed away this summer and we were preparing to sell her home in Stockton, California. I called Burns Estate Liquidator, they came in and gave us great advice, organized everything in the house and then prepared everything for sale - The whole experience was such a positive experience. The items that did not sell they arranged to have everything that was left over get picked up by the charity of our choice. Susanne was there to take care of the donation pick up so that we did not have to worry about it, we ended up with a nice donation slip! Before Susanne was finished she made sure everything was nice and clean at the house. The highest recommendation to Burns Estate Liquidator. My husband (Bill) and I hired Susanne & Erika Burns from Burns Estate Liquidators to help us downsize from 3,500 square feet to 2,000. We were downsizing for retirement. Every inch of our home was decorated with high-end decorator furniture and objects of art. To say this was an emotional and stressful time in our lives would be an understatement. But Susanne and Erika were (are) the epitome of grace and professionalism. From the first meeting through the end of the liquidation we felt comfortable, supported and 100% sure that we were making the right decision— not only to downsize, but also to hire Susanne & Erika. I can't tell you in this review the peace of mind they brought to this transitional time in our lives. I was lucky to find Susanne and Erika at a very difficult time, after the death of my mother. Dealing with the contents of her house was complicated because I live out of state. They worked with me from a distance, were flexible with my circumstances, set up in my absence, so when I came to clear her house things were well underway. They were meticulous and businesslike in their work, sorting, categorizing, staging and pricing all of the things. It was beautifully done. And they are lovely people. Working with them was a joy, and I could not have done it without their efficient, professional help, and their sensitivity. When the sale was done, Susanne helped me arrange donating the remaining furniture and other items to worthy causes in the area. It was a great success, and I feel they went above and beyond the call of duty. Estate sale fees are high -- 50% is average -- but when I saw what they did, and what a lot of work it was, I felt they more than earned it. Also, estate liquidators are unregulated, so you can't be sure what you are getting into without solid referrals. Susanne and Erika, in my experience, are conscientious, honest and completely trustworthy. They know the territory well, whether the items are "smalls" or antiques. I hIghly recommended them. Arranged for sale of selected items from my mothers estate by contacting, monitoring and negotiating with her dealer contacts to obtain fair compensation for items sold. Great! Gave Susanna the key to the house and collected the money along with photos and an itemized list of the items sold. The house and the contents were treated with respect and Susanna made sure I knew when she would be at the house, who she was taking in and when they were done. All done very professionally. ....... Very professional and polite. Susanne is a really easy person to work with and goes above and beyond for her clients. Susanne was extremely professional and helpful. She is very knowledgeable and personable to work with. In addition, she was very ethical and straightforward in our interactions. I was very nervous taking my antique sliver to meet with a stranger, but Susanne was very professional and described exactly what would happen that put me at ease. She was wonderful at replying quickly to my emails promptly. I highly recommend her services. She really knows silver, silver-plate, and other precious metals. First and foremost, I was very pleased with the work of Susanne and Erika (and all their helpers). There is absolutely no way I could have done this without their help. They are kind, sensitive and very responsive to individual needs. 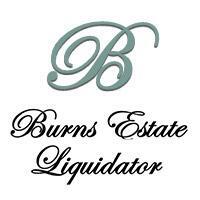 Anyone that is going through the loss of a parent or loved one, I encourage you to use Burns Estate Liquidators. I met with three different companies, and there was nobody even close to the professionalism that Burns provided. The service not only included arranging everything, but they also cleaned up everything afterwards. They are very professional and made the process very easy. I had to move and they handled everything in my absence. I would recommend them highly. The first day of the sale, they had 150 people waiting to come in. They really did a great job advertising and promoting the sale. As difficult as the process was for me, Suzanne and Erika were always respectful of my family's history and our possessions, and they took care of me. Each time I visited during the discovery and staging phase, they helped me process more, provided comfort and insight, gave me advice on when to be there and when to stay away for my own sake, and helped me move through it all. We talked about loss, moving on, blessing and letting go. They took the time to get to know my siblings and me, my parents, and our history. I knew returning to an empty house would be hard, but they were there, the house was clean, and again, we talked and processed these last steps. The goal was accomplished....nothing was left for me or my brother to manage.